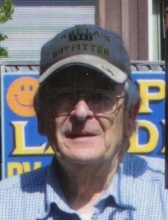 George “Allyn” Webster, 77, of Albany, OR, peacefully passed away on Tuesday, October 30, 2018. George is survived by sister Ramona, son Daren, daughters Lisa and Amy and four grandchildren and three great grandchildren, several nieces and nephews. George was preceded in death by his parents, George and Irma Webster, wife Elsie, brothers David and Myron. George was a loving, generous, and caring father, grandfather, and friend to everyone. George loved fishing, gardening, traveling and spending time with family and friends. George enjoyed sharing stories. He worked for the USDA as a fruit and vegetable inspector for 37 years. George especially enjoyed family and helping others. Visitation will be from 4:00-7:00 pm at Chapel of Macy and Son, 135 NE Evans, McMinnville, OR on Tuesday, November 6, 2018. Funeral services will be held at 11:00am on Wednesday, November 7, 2018 at Chapel of Macy and Son, McMinnville. George will be laid to rest at Evergreen Memorial Park in McMinnville, OR. Also, the family would like to extend their sincerest gratitude toward Macy and Son Funeral Home for being very accommodating and understanding during this difficult time. To send flowers or a remembrance gift to the family of George "Allyn" Webster, please visit our Tribute Store. "Email Address" would like to share the life celebration of George "Allyn" Webster. Click on the "link" to go to share a favorite memory or leave a condolence message for the family.